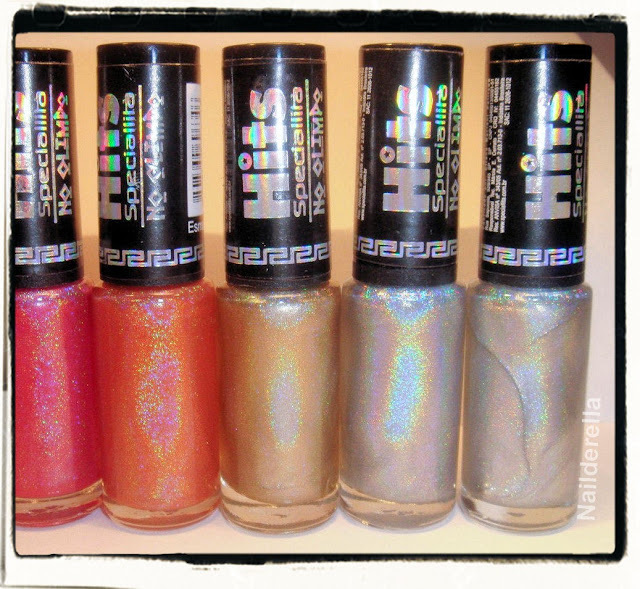 Yesterday I received my amazing and unbelivable swap with Rafa and among the lovely polishes she sent me, there were all the polishes from the Hits no Olimpo collection! I couldn't resist to try them. As I didn't know which one to try first, I swatched them all on a nail wheel. 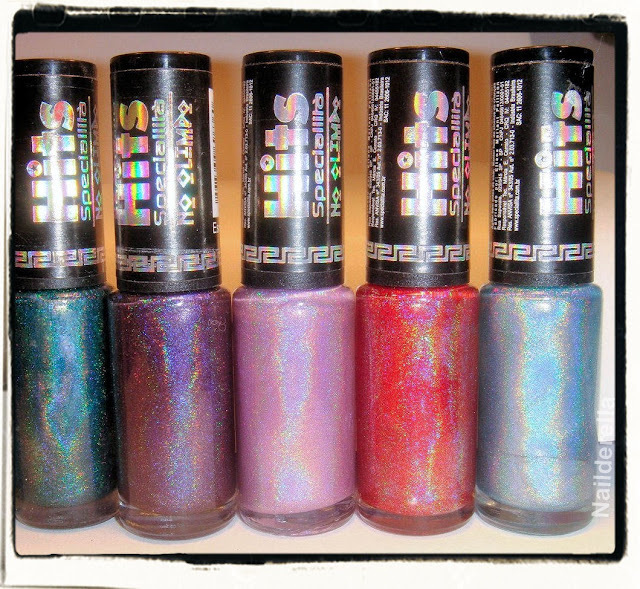 Of course, I'll swatch them on my nails and show you all this beauties. But I also think it might be useful to have them all in one post. Just a few words on the brand. Hits Speciallità is a Brazilian brand and they released last year a gorgeous collection of holographic polishes! Be aware this is not a 3Free brand (there are some toluene, a formaldehyde resin and dibutylphtalate in them) and they stink. If you want a 3Free alternative for holographic polishes, you can go to Ludurana or Glitter Gal. 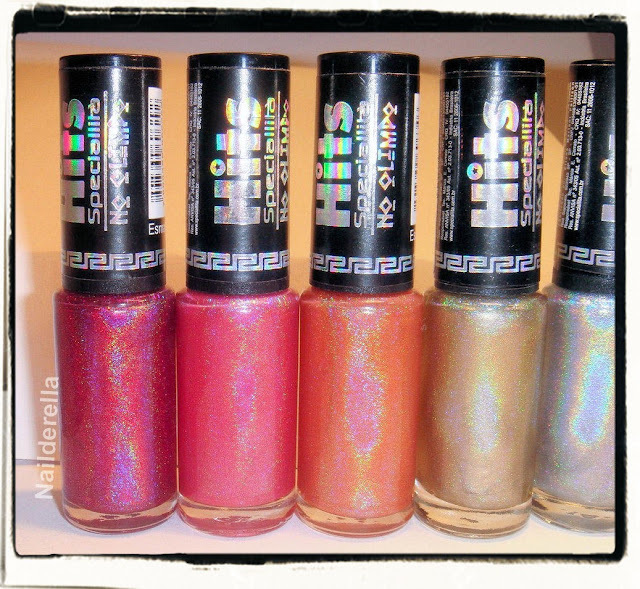 A-England will also soon release a new holo line! Upper row, l-r: Atena, Afrodite, Deméter, Hermes, Artemis, Hefesto, lower row: Zeus, Apolo, Hera, Dionísio, Héstia, Ares, Poseidon. 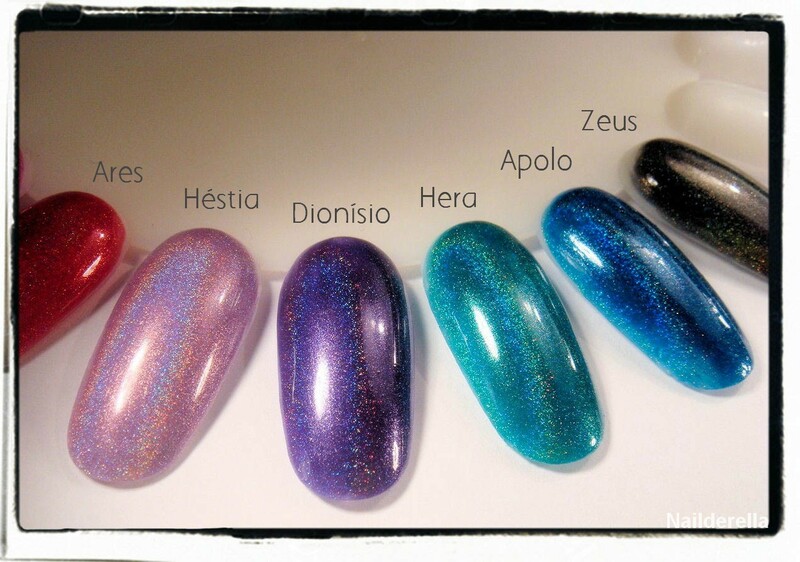 l-r: Zeus, Apolo, Hera, Dionísio, Héstia. l-r: Hera, Dionísio, Héstia, Ares, Poseidon. 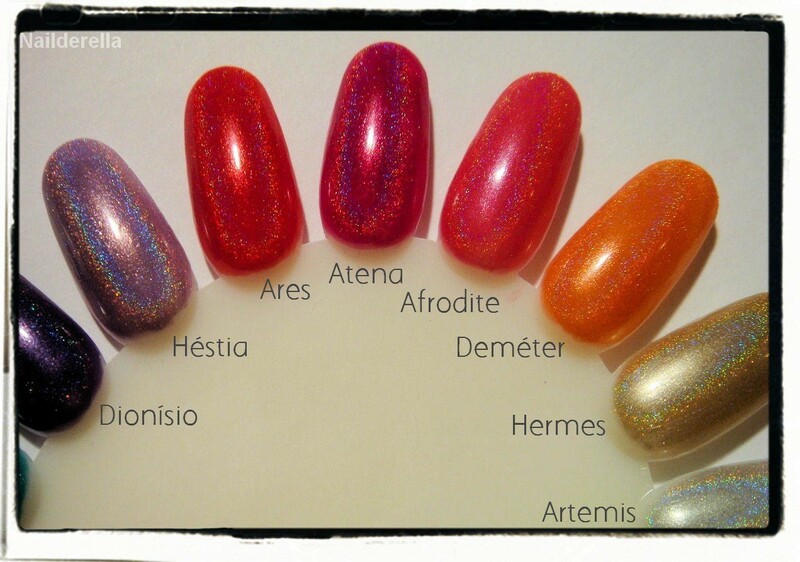 l-r: Atena, Afrodite, Deméter, Hermes, Artemis. 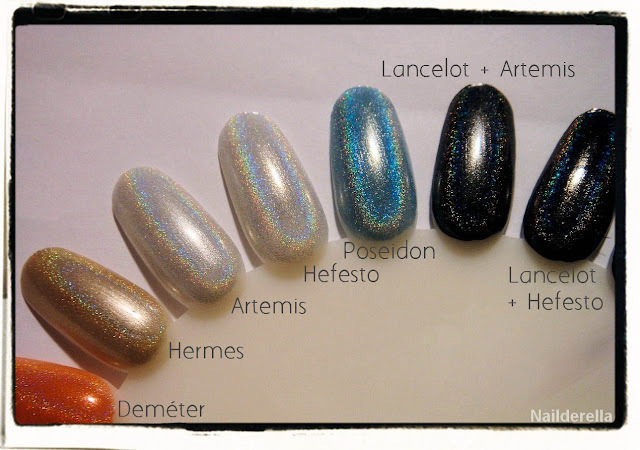 l-r: Afrodite, Deméter, Hermes, Artemis, Hefesto. Then the nail wheel swatches. All the swatches are 2 coats of polish (without top coat), no flash, artificial light (no sun). Lancelot is from A-England It's a blackened red, almost black. GG = Glitter Gal. 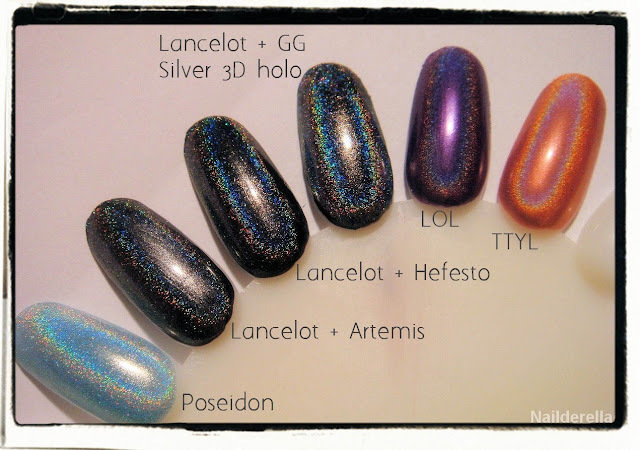 On the above picture, I wanted to compare Artemis, Hefesto, and Glitter Gal Silver 3D Holo (GGNP 707H) as holo top coats. Glitter Gal and Hefesto are in real life identical, or at least very close. On the swatch here, I used a thicker coat of Gliter Gal so it seems a little more holo but if you apply the same amount, Glitter Gal is not more holo than Hefesto. They are both amazing top coats, very very holographic! Artemis also works as a top coat but gives a frostier effect, it's more metallic and slightly less holo. This is due to the metallic finish. I also added China Glaze LOL and TTYL to see the difference in terms of holo effect. China glaze have even finer holo particles and look more "matte" than Hits holo. Hits are more glossy. You can see and feel the difference also when you touch them. Hermes has the same kind of metallic finish as Artemis. 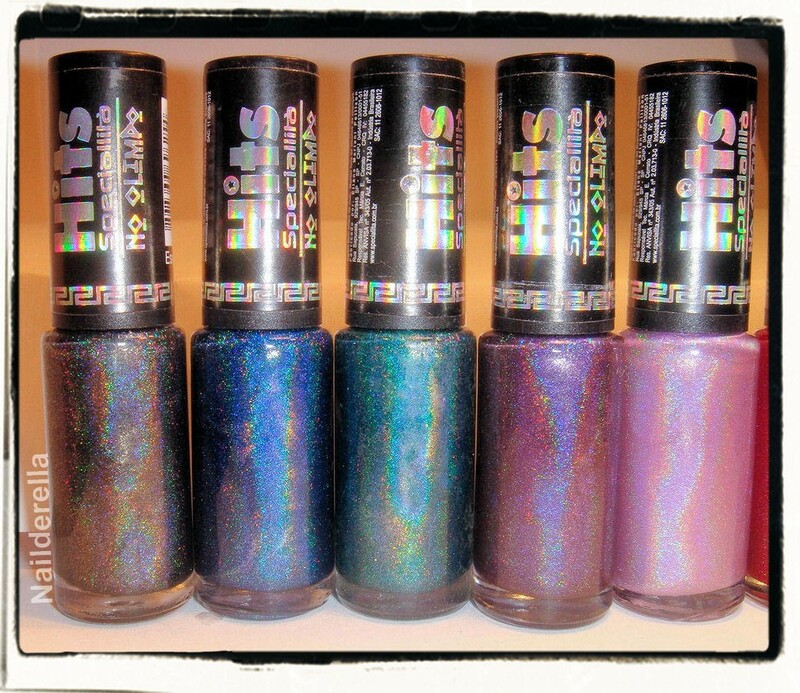 I'll do swatches on my nails soon! But I've also prepared comparison swatches between Ludurana Show, Reluz and Emocionante, and Ozotic 504, 505, and 506! 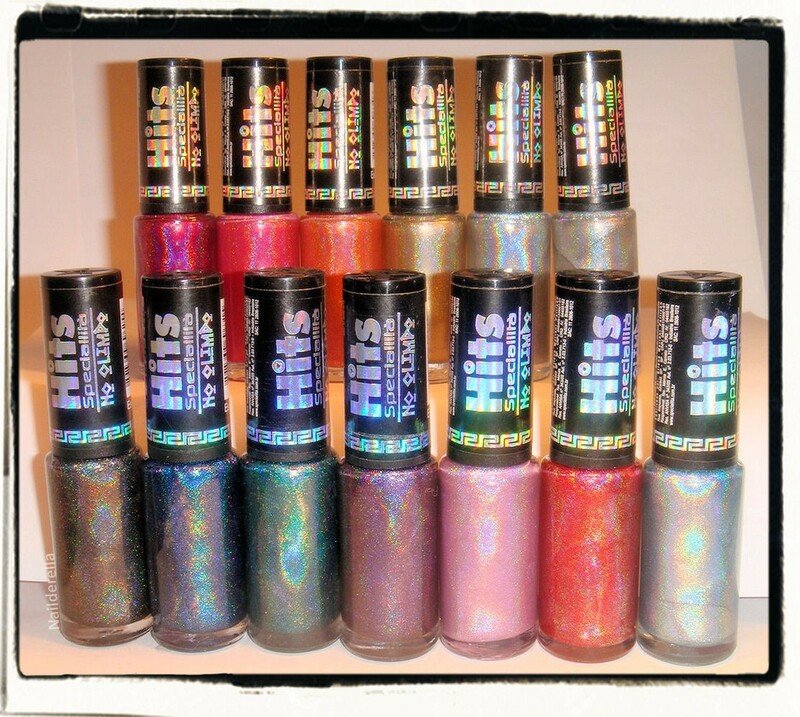 Hits polishes can be purchased from Llarowe. Each bottle contain 6 mL. Hits holographic polishes cost $10 each. Don't forget, Hits has also multichrome and flakies polishes! Llarowe is the US stockist for Glitter Gal, Ozotic, A-England, Hits, Ludurana and Lynnderella polishes, awesome nail polish brands.They sell internationally and have an awesome customer service. You can visit Llarowe on Facebook.